Overall, less than half of undergraduates pay the publicly posted sticker prices because they receive scholarships allowing them to pay lower “net prices.” Unfortunately, most colleges keep secret their formulas for deciding who gets how much of a scholarship (or discount), making it difficult for families to predict their costs ahead of time. That complexity and secrecy also presents a challenge to reporters covering the increasingly hot issues of college costs, affordability and value, according to a panel of college pricing experts and higher education journalists who spoke at the Education Writers Association’s 2018 National Seminar. Luckily, the experts said, there are several tools and strategies journalists can use to shine a clear and helpful light on this topic. There are several sources of reliable data on college “sticker” prices. The Education Department’s College Navigator allows you to quickly look up the last several years’ pricing data for any individual college. The College Board’s annual “Trends in Pricing” report offers many useful spreadsheets and graphs showing pricing trends for the nation, states, and different types of colleges. 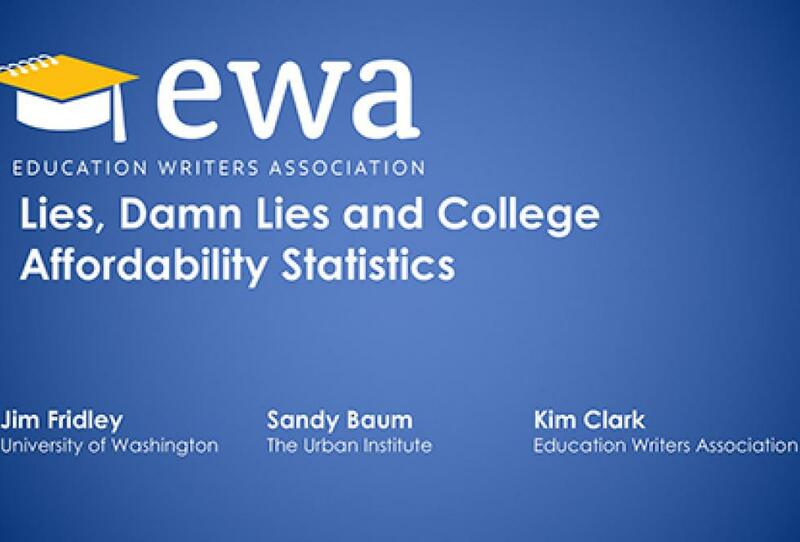 The experts on the EWA panel in Los Angeles warned reporters to be careful about which “net price” data (typically defined as sticker price minus scholarships) to focus on. Cappy Bond Hill, a former president of Vassar College who now heads work to broaden college access and success at Ithaka S+R, urged reporters to focus on the data narrowed by income bands. “Average doesn’t tell you anything,” she said. Instead, isolating net prices by family income brackets more clearly shows how affordable a college is. The College Board publishes a slightly different with net price national averages for different types of colleges. Unlike IPEDS, the College Board also subtracts out the value of tax breaks from its net prices. Don’t forget to consider all of the costs of college – especially living expenses, including housing, food, parking and transportation – urged Sandy Baum, a non-resident fellow at the Urban Institute who authors the annual “Trends in College Pricing” report for the College Board each fall. Those seemingly extraneous costs are a persistent challenge for many college students, especially if they’re forgoing a full-time income to attend classes, she said. “This is what does many students in,” Baum said. Colleges generally publish the price of a credit hour, class, semester or year. But the goal of almost every student is a degree. And although a bachelor’s degree is considered a “four-year” degree, the typical student takes 4-1/2 years to earn one. And many take at least five, said Baum. Not only does that mean students have to pay extra tuition, but they have to cover their living expenses, which, in many cases, are higher than tuition. . So schools with higher tuition but high four-year graduation rates might be cheaper in the long run than schools with lower tuition that require students to pay for another full year of school. Getting students to the finish line faster “is the biggest thing you can do to increase affordability,” Baum said. Reporters can look up four-, five-, and six-year graduation rates for each college on IPEDS. With all the attention paid to the immediate costs, it can be easy to lose sight of the single most important aspect of college affordability over the long run: value. A college with a low net price that offers a subpar education, and no counseling or support, isn’t a good deal over the student’s lifetime. But schools that boost students to completion and into good jobs repay their costs many times over during the student’s lifetime. One example of a best practice combining fairly low costs with high value is the City University of New York’s ASAP program. That program covers tuition and fees, provides free tutoring and advising, and even offers free subway passes to participating students, said Robert Shireman, a senior fellow at The Century Foundation and a former Obama administration staffer. What makes ASAP better than most other free community college programs is that it provides other benefits, like passes for public transportation, help paying for books, and lots of tutoring and advising, he said. “What ASAP did was spend more money supporting the students: smaller classes and support staff,” he said. While those extra supports mean the cost per student per semester is higher, research has found that so many ASAP students earn an associate’s degrees quickly that the cost per degree – for both students and the CUNY system – is lower than the cost per degree for standard CUNY students. The Education Department’s College Scorecard also offers measures journalists can use to gauge the job market value of a college’s offerings, said Sarah Butrymowicz, the data editor for The Hechinger Report. While the purpose of a college education isn’t solely to earn money, reporters can, for example, check out how many alumni of each college are repaying their student loans, are employed, or are earning more than $25,000. The Scorecard database is huge and can be intimidating. Downloading the whole thing often causes Excel to crash. Butrymowicz suggested reporters use filtering to break it into chunks to make the data more manageable.